Allocates a set of demand points (Customers) to user specified number of supply points (Facilities) out of a Facilities point dataset based on the Euclidian distance between the Customers and Facilities. In other words the function selects N Facilities out of K candidates to service a set of M Customer locations in such a way that each Customer is allocated to a single Facility (based on Euclidean distance) and the total distance between the Customers and selected Facilities is minimized. In a more simple way: take a bunch of customers and assign them the closest facility (using euclidean distance, the “ordinary” (i.e. straight-line) distance between two points)). In this particular theoretical analysis I have also selected a maximum range of 5000 meters so anything beyond won’t be taken into consideration. Questions: Am i giving a proper service with those facilities i have already deployed?. Is there any of them way too far away so we cannot service at all?. Is there any of them over populated and in the end we cannot provide a proper service?. If you happen to come across any other question, please add it to comments so i can modify the post. Hope you guys have liked it, if so, share or let me know about it. 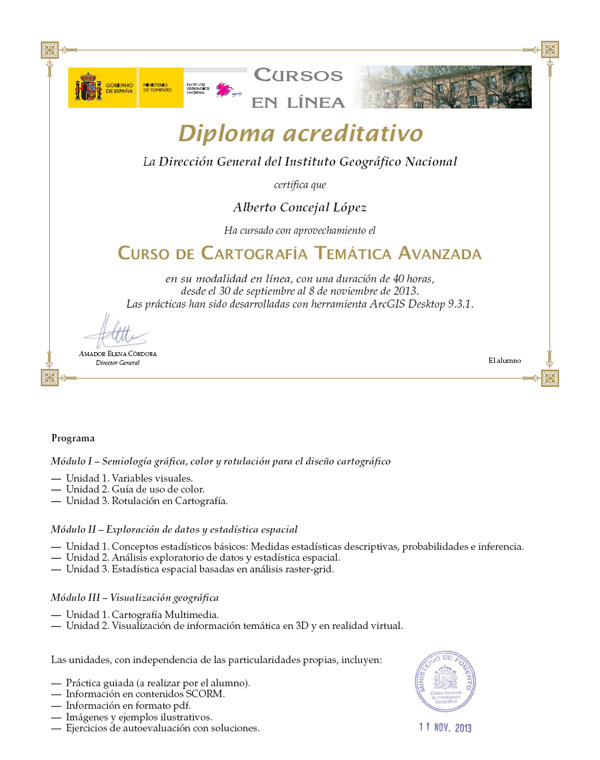 A few lines for leting you know i passed this course last year 2013 in Instituto Geográfico of Spain (IGN). Spatial analysis, Spatial stats, proper simbolization, data mining and geovisualization. A very interesting 40h online course that helps me on a daily basis to be able to show geodata in a more professional way. Because we normally need to deepen our geodata without making too complex to understand the result of our analysis.